This week, I am focusing on providing resources to “Squash the Summer Slide” as ReadWriteThink puts it. Parents often ask me at this time of year for ideas to keep my students challenged over the summer, and here is one that would be great for students who enjoy writing. Summer Superheroes is a “Parent & After School Resource” on ReadWriteThink. It offers an interesting twist to the concept of creating your own superhero by challenging the author to invent a superhero whose powers are somehow dependent on the warmest season of the year. The detailed instructions for motivating the child and for helping him or her to develop the story include interactive resources on the ReadWriteThink site. This would be a fun idea to share with parents, or to use in the last month of school – when everyone’s mind is on summer anyway! I recently discovered this set of word picture brainteasers on the “Kids Pages” area of the National Institute of Environmental Health Sciences website. If you make it to the bottom of the page, you will see a link for more, and the same link appears on the next page, and the next… There is a seemingly endless amount of these puzzles available for eager students to solve. 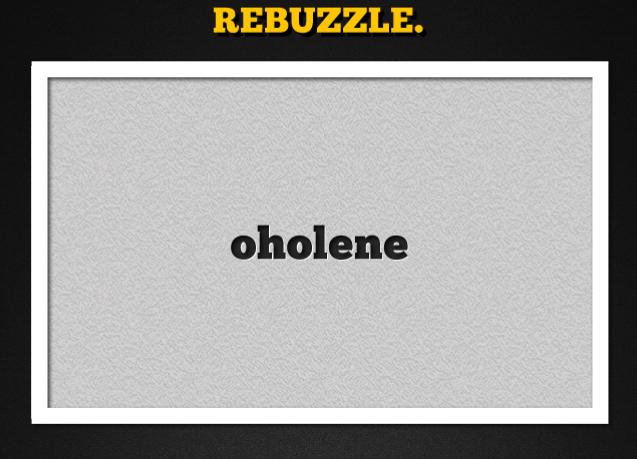 But, if those are not enough, you also download the free app, “Rebuzzle”, on your iDevice to further challenge your kids. Of course, some of the phrases are a bit outdated, so you may need to have the kids do a little research to find the meaning and the origin of some of the more archaic answers! Inference Riddle Game is a site created by Phil Tulga that has 15 inference riddles. The user can decide which riddle to work on by typing in a number, and can slowly add clues until he or she guesses the answer, types it in, and checks it. This would be fun to play with the class when there is a small wait time for something. When I play games like this with my students, I always ask them to justify their guesses. They are also discouraged from “wild guesses” by being told they will be out of the game if they guess incorrectly. Another way to use this site would be as a springboard for students to create their own riddles – perhaps using Powerpoint or another presentation option – that are related to something that is being studied. Go on a Family Adventure! National Geographic has an Education site that is in Beta right now. Just in time for the summer, you can visit the site to play “Go on a Family Adventure!” You can choose whether you would like to do a Land or Sea Adventure, which route you would like to take, and the difficulty level. It’s a great way to practice your geography skills, see how long it typically takes to travel around the map, and to even see photographs of each of your destinations. Word Sort is one of the many “brain games” offered by Lumosity. In this particular one, cards are revealed one at a time. Each card has a word on it, and the player must determine whether or not the card “follows the rule”. At first, the player has to randomly guess, but should soon see a pattern in the words that fall into the rule-following pile. Once the player is able to correctly classify 6 words in a row, he or she is eligible for the next level. This is a good game for practicing vocabulary and logical reasoning. It would also be a neat idea to extend it further for higher level students by asking them to create their own games with words from the curriculum.